The Jedox Web Advanced Rule Editor allows UI-driven creation and editing of OLAP rules. The Advanced Rule Editor also supports creating and editing rule templates. The selection areas are described below, indicated by the numbers in the screenshot above. List box to define the elements that the rule applies to. Options are All Elements, Base Elements, and Consolidated Elements. List box to select the rule form. 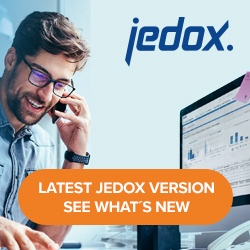 In Jedox 7.1, only Classic form is possible. List box to select the target dimension. List box to select the source dimension. The formula tree of the source in the Advanced Rule Editor is collapsed by default from the second level onwards. With the buttons (1) and (2) you can collapse or expand all source lines. Additionally, users can now control whether the Advanced Rule Editor panel should be collapsed or expanded by default, via right button click (3) on the Rule Editor panel label. The Rule Editor features syntax editing, as shown in the screenshot below. You can also enable auto-completion when typing a rule formula. To activate this feature, type the key combination <CTRL>+<SPACE>. Learn more about the Rule Editor in a free online course from Jedox Academy! Just enter your email address when prompted, and the video will begin playing.